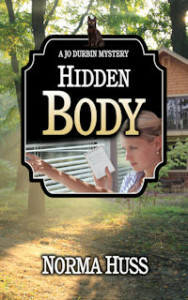 Hid­den Body, a pre­quel mys­tery nov­el­ette, is part of the Jo Durbin Mys­ter­ies. Jo’s sis­ter is prepar­ing a cot­tage by Chesa­peake Bay for sale. Jo is along to write up the glow­ing words that will entice buy­ers to an Open House. When a black cat cross­es their path, is it bad luck? Or, just maybe, that cat may lead to solv­ing a mys­tery.